Elementary particles are particles with no measurable internal structure; that is, they are not composed of other particles. They are the fundamental objects of quantum field theory. Many families and sub-families of elementary particles exist. Elementary particles are classified according to their spin. Fermions have half-integer spin while bosons have integer spin. All the particles of the Standard Model have been experimentally observed, recently including the Higgs boson. Fermions are one of the two fundamental classes of particles, the other being bosons. Fermion particles are described by Fermi–Dirac statistics and have quantum numbers described by the Pauli exclusion principle. They include the quarks and leptons, as well as any composite particles consisting of an odd number of these, such as all baryons and many atoms and nuclei. Fermions have half-integer spin; for all known elementary fermions this is 1⁄2. All known fermions, except neutrinos, are also Dirac fermions; that is, each known fermion has its own distinct antiparticle. It is not known whether the neutrino is a Dirac fermion or a Majorana fermion. Fermions are the basic building blocks of all matter. They are classified according to whether they interact via the color force or not. In the Standard Model, there are 12 types of elementary fermions: six quarks and six leptons. Quarks are the fundamental constituents of hadrons and interact via the strong interaction. Quarks are the only known carriers of fractional charge, but because they combine in groups of three (baryons) or in groups of two with antiquarks (mesons), only integer charge is observed in nature. Their respective antiparticles are the antiquarks, which are identical except for the fact that they carry the opposite electric charge (for example the up quark carries charge +2⁄3, while the up antiquark carries charge −2⁄3), color charge, and baryon number. There are six flavors of quarks; the three positively charged quarks are called "up-type quarks" and the three negatively charged quarks are called "down-type quarks". Leptons do not interact via the strong interaction. Their respective antiparticles are the antileptons which are identical, except for the fact that they carry the opposite electric charge and lepton number. The antiparticle of an electron is an antielectron, which is nearly always called a "positron" for historical reasons. There are six leptons in total; the three charged leptons are called "electron-like leptons", while the neutral leptons are called "neutrinos". Neutrinos are known to oscillate, so that neutrinos of definite flavor do not have definite mass, rather they exist in a superposition of mass eigenstates. The hypothetical heavy right-handed neutrino, called a "sterile neutrino", has been left off the list. Bosons are one of the two fundamental classes of particles, the other being fermions. Bosons are characterized by Bose–Einstein statistics and all have integer spins. Bosons may be either elementary, like photons and gluons, or composite, like mesons. The graviton is added to the list although it is not predicted by the Standard Model, but by other theories in the framework of quantum field theory. Furthermore, gravity is non-renormalizable. There are a total of eight independent gluons. The Higgs boson is postulated by the electroweak theory primarily to explain the origin of particle masses. In a process known as the "Higgs mechanism", the Higgs boson and the other gauge bosons in the Standard Model acquire mass via spontaneous symmetry breaking of the SU(2) gauge symmetry. The Minimal Supersymmetric Standard Model (MSSM) predicts several Higgs bosons. A new particle expected to be the Higgs boson was observed at the CERN/LHC on March 14, 2013, around the energy of 126.5GeV with an accuracy of close to five sigma (99.9999%, which is accepted as definitive). The Higgs mechanism giving mass to other particles has not been observed yet. neutralino neutral bosons 1⁄2 The neutralinos are superpositions of the superpartners of neutral Standard Model bosons: neutral Higgs boson, Z boson and photon. The lightest neutralino is a leading candidate for dark matter. The MSSM predicts four neutralinos. chargino charged bosons 1⁄2 The charginos are superpositions of the superpartners of charged Standard Model bosons: charged Higgs boson and W boson. The MSSM predicts two pairs of charginos. photino photon 1⁄2 Mixing with zino and neutral Higgsinos for neutralinos. wino, zino W± and Z0 bosons 1⁄2 The charged wino mixing with the charged Higgsino for charginos, for the zino see line above. Higgsino Higgs boson 0 For supersymmetry there is a need for several Higgs bosons, neutral and charged, according with their superpartners. gluino gluon 1⁄2 Eight gluons and eight gluinos. gravitino graviton 3⁄2 Predicted by supergravity (SUGRA). The graviton is hypothetical, too – see next table. sleptons leptons 0 The superpartners of the leptons (electron, muon, tau) and the neutrinos. sneutrino neutrino 0 Introduced by many extensions of the Standard Supermodel, and may be needed to explain the LSND results. A special role has the sterile sneutrino, the supersymmetric counterpart of the hypothetical right-handed neutrino, called the "sterile neutrino". squarks quarks 0 The stop squark (superpartner of the top quark) is thought to have a low mass and is often the subject of experimental searches. Note: just as the photon, Z boson and W± bosons are superpositions of the B0, W0, W1, and W2 fields – the photino, zino, and wino± are superpositions of the bino0, wino0, wino1, and wino2 by definition. No matter if one uses the original gauginos or this superpositions as a basis, the only predicted physical particles are neutralinos and charginos as a superposition of them together with the Higgsinos. graviton 2 Has been proposed to mediate gravity in theories of quantum gravity. graviscalar 0 Also known as "radion". graviphoton 1 Also known as "gravivector". axion 0 A pseudoscalar particle introduced in Peccei–Quinn theory to solve the strong-CP problem. axino 1⁄2 Superpartner of the axion. Forms, together with the saxion and axion, a supermultiplet in supersymmetric extensions of Peccei–Quinn theory. branon ? Predicted in brane world models. dilaton 0 Predicted in some string theories. dilatino 1⁄2 Superpartner of the dilaton. X and Y bosons 1 These leptoquarks are predicted by GUT theories to be heavier equivalents of the W and Z.
magnetic photon ? A. Salam (1966). "Magnetic monopole and two photon theories of C-violation." Physics Letters 22 (5): 683–684. majoron 0 Predicted to understand neutrino masses by the seesaw mechanism. majorana fermion 1⁄2 ; 3⁄2 ?... gluino, neutralino, or other – is its own antiparticle. chameleon 0 a possible candidate for dark energy and dark matter, and may contribute to cosmic inflation. Mirror particles are predicted by theories that restore parity symmetry. "Magnetic monopole" is a generic name for particles with non-zero magnetic charge. They are predicted by some GUTs. "Tachyon" is a generic name for hypothetical particles that travel faster than the speed of light and have an imaginary rest mass. Preons were suggested as subparticles of quarks and leptons, but modern collider experiments have all but ruled out their existence. Kaluza–Klein towers of particles are predicted by some models of extra dimensions. The extra-dimensional momentum is manifested as extra mass in four-dimensional spacetime. Composite fermions, in which case they are called baryons. Composite bosons, in which case they are called mesons. quarks and/or antiquarks, tightly bound by the color force, which is mediated by gluons. A "sea" of virtual quark-antiquark pairs is also present in each hadron. A combination of three u, d or s-quarks with a total spin of 3⁄2 form the so-called "baryon decuplet". Proton quark structure: 2 up quarks and 1 down quark. The gluon tubes or flux tubes are now known to be Y shaped. Ordinary baryons (composite fermions) contain three valence quarks or three valence antiquarks each. Hyperons, such as the Λ, Σ, Ξ, and Ω particles, which contain one or more strange quarks, are short-lived and heavier than nucleons. Although not normally present in atomic nuclei, they can appear in short-lived hypernuclei. A number of charmed and bottom quark baryons have also been observed. Some hints at the existence of exotic baryons have been found recently; however, negative results have also been reported. Their existence is uncertain. Pentaquarks consist of four valence quarks and one valence antiquark. Ordinary mesons are made up of a valence quark and a valence antiquark. Because mesons have spin of 0 or 1 and are not themselves elementary particles, they are "composite" bosons. 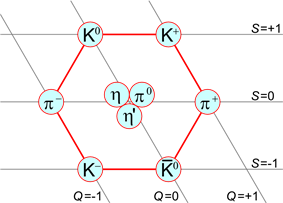 Examples of mesons include the pion, kaon, and the J/ψ. In quantum hydrodynamic models, mesons mediate the residual strong force between nucleons. At one time or another, positive signatures have been reported for all of the following exotic mesons but their existences have yet to be confirmed. Hybrid mesons consist of one or more valence quark-antiquark pairs and one or more real gluons. A semi-accurate depiction of the helium atom. In the nucleus, the protons are in red and neutrons are in purple. In reality, the nucleus is also spherically symmetrical. Atomic nuclei consist of protons and neutrons. Each type of nucleus contains a specific number of protons and a specific number of neutrons, and is called a "nuclide" or "isotope". Nuclear reactions can change one nuclide into another. See table of nuclides for a complete list of isotopes. Atoms are the smallest neutral particles into which matter can be divided by chemical reactions. An atom consists of a small, heavy nucleus surrounded by a relatively large, light cloud of electrons. Each type of atom corresponds to a specific chemical element. To date, 118 elements have been discovered, while only the elements 1–112,114, and 116 have received official names. The atomic nucleus consists of protons and neutrons. Protons and neutrons are, in turn, made of quarks. Molecules are the smallest particles into which a non-elemental substance can be divided while maintaining the physical properties of the substance. Each type of molecule corresponds to a specific chemical compound. Molecules are a composite of two or more atoms. See list of compounds for a list of molecules. Phonons are vibrational modes in a crystal lattice. Excitons are bound states of an electron and a hole. Plasmons are coherent excitations of a plasma. Polaritons are mixtures of photons with other quasi-particles. Polarons are moving, charged (quasi-) particles that are surrounded by ions in a material. Magnons are coherent excitations of electron spins in a material. An anyon is a generalization of fermion and boson in two-dimensional systems like sheets of graphene that obeys braid statistics. A plekton is a theoretical kind of particle discussed as a generalization of the braid statistics of the anyon to dimension > 2. A WIMP (weakly interacting massive particle) is any one of a number of particles that might explain dark matter (such as the neutralino or the axion). The pomeron, used to explain the elastic scattering of hadrons and the location of Regge poles in Regge theory. The skyrmion, a topological solution of the pion field, used to model the low-energy properties of the nucleon, such as the axial vector current coupling and the mass. A genon is a particle existing in a closed timelike world line where spacetime is curled as in a Frank Tipler or Ronald Mallett time machine. A goldstone boson is a massless excitation of a field that has been spontaneously broken. The pions are quasi-goldstone bosons (quasi- because they are not exactly massless) of the broken chiral isospin symmetry of quantum chromodynamics. A goldstino is a goldstone fermion produced by the spontaneous breaking of supersymmetry. An instanton is a field configuration which is a local minimum of the Euclidean action. Instantons are used in nonperturbative calculations of tunneling rates. A dyon is a hypothetical particle with both electric and magnetic charges. A geon is an electromagnetic or gravitational wave which is held together in a confined region by the gravitational attraction of its own field energy. An inflaton is the generic name for an unidentified scalar particle responsible for the cosmic inflation. A spurion is the name given to a "particle" inserted mathematically into an isospin-violating decay in order to analyze it as though it conserved isospin. What is called "true muonium", a bound state of a muon and an antimuon, is a theoretical exotic atom which has never been observed. A tardyon or bradyon travels slower than light and has a non-zero rest mass. A luxon travels at the speed of light and has no rest mass. A tachyon (mentioned above) is a hypothetical particle that travels faster than the speed of light and has an imaginary rest mass. List of compounds for a list of molecules. Periodic table for an overview of atoms. Standard Model for the current theory of these particles. ^ Observation of a new boson at a mass of 125 GeV with the CMS experiment at the LHC (2013). arXiv:1207.7235. ^ Observation of a new particle in the search for the Standard Model Higgs boson with the ATLAS detector at the LHC (2012). arXiv:1207.7214. ^ B. Kayser, Two Questions About Neutrinos, arXiv:1012.4469v1 [hep-ph] (2010). ^ R. Maartens (2004). Brane-World Gravity (PDF). Also available in web format at http://www.livingreviews.org/lrr-2004-7.